One of the biggest scores in Mafia history, the Lufthansa Airlines heist of 1978 has become the stuff of Mafia legend-and a decades-long investigation that continues to this day. 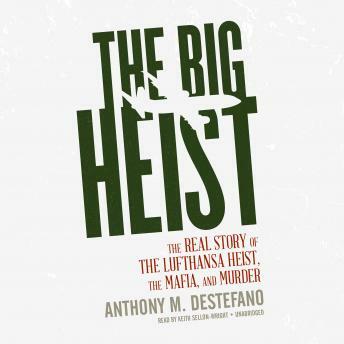 Pulitzer Prize-winning reporter Anthony DeStefano sheds new light on this legendary unsolved case using recent evidence from the 2015 trial of eighty-year-old Mafia don Vincent Asaro, who for the first time speaks out on his role in the fateful Lufthansa heist. This blistering you-are-there account takes you behind the headlines and inside the ranks of America's infamous crime families-with never-before-told stories, late-breaking news, and bombshell revelations. An invaluable addition to any crime library, this is the most complete, thorough, and up-to-date account of the Lufthansa heist currently available. Pulitzer Prize winner Anthony DeStefano draws from his years of experience reporting on the mob for New York Newsday-as well as his firsthand coverage of the Asaro indictment and attendance at the trial-to expose the all-too-human heart of organized crime in America. The Big Heist is thrilling, shocking, and impossible to put down.